President-elect Donald Trump has made an illogically logical choice for his first U.S. Treasury secretary. Steven Mnuchin’s Wall Street past will rankle Democrats. But unlike many Trump has put on his team, he is neither an ideologue nor a populist. He’s also well qualified for the job, bipartisan and relatively reserved. Mnuchin’s career as a financier won’t make for a smooth ride though confirmation hearings. He spent 17 years at Goldman Sachs, running mortgage securities before becoming chief information officer. He left in 2002 to set up his own hedge fund, Dune Capital, which helped finance hit movies like “Avatar.” And he and fellow investors made a 150 percent profit in five years turning around defunct mortgage lender IndyMac that they bought in 2009. Lobby groups are already coming out against his nomination, in part because of accusations that the renamed OneWest Bank’s foreclosure policies were too aggressive. People “should be terrified by the prospect of a Treasury Secretary Mnuchin,” the Take on Wall Street campaign said on Tuesday. Republicans, though, have the majority needed to confirm him. And he’s not red through and through. He has given money multiple times to Charles Schumer, who will be the Democrats’ next Senate leader. He donated to Barack Obama’s first presidential campaign and earlier this year stumped up cash for Kamala Harris, who won a California senate seat in this month’s election. He even recently floated the idea of creating an infrastructure bank, a plan earlier pitched by Democratic presidential candidate Hillary Clinton. That suggests a more pragmatic approach to the job than, say Attorney General nominee Jeff Sessions or Health and Human Services appointee Tom Price. Such an approach could help him balance competing views while pushing for some of Trump’s major first-year goals, like a tax code overhaul, infrastructure spending and a government budget that could substantially increase the national debt. In a rare quality for Washington insiders, Mnuchin also doesn’t seek the limelight, which could appeal to lawmakers eager to take credit for policy wins. It all bodes well for America’s fiscal policy. Steven Mnuchin, the Trump campaign's finance director, arrives at U.S. President-elect Donald Trump's Trump Tower in New York, U.S., November 29, 2016. 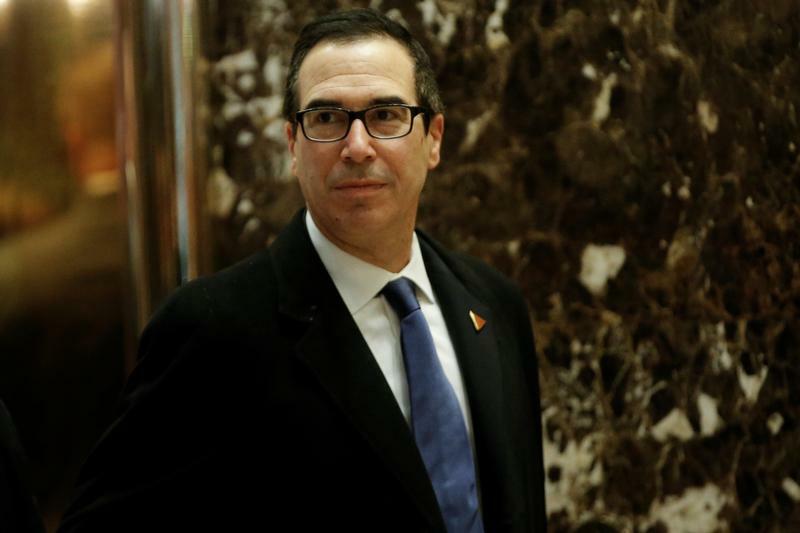 U.S. President-elect Donald Trump chose Steven Mnuchin as his Treasury secretary, Mnuchin told CNBC on Nov. 30. Mnuchin was Trump’s campaign finance chairman and spent 17 years at Goldman Sachs. He left the bank in 2002 and eventually set up his own hedge fund, Dune Capital, which among other things financed Hollywood movies such as "Avatar". Mnuchin also was part of a consortium of investors who in 2009 bought many of the assets of IndyMac, the mortgage lender that went bankrupt a year earlier. Mnuchin was chairman and chief executive of IMB Holdco, which bought the assets, as well as chairman of OneWest, the new name for the resurrected IndyMac. He and his fellow investors agreed to sell the bank to CIT Group in 2014 for $3.4 billion. The deal was finalized the following year.